Hydrochlorothiazide is widely used throughout the US and Western Europe, as a diuretic and antihypertensive agent. However, two recent large-scale pharmacoepidemiological studies have confirmed a link between the use of this pharmacological agent and non-melanoma skin cancer (NMSC), prompting an update of the drug’s safety information. Both studies analysed data from the Danish National Registry – the Cancer Registry and the Prescription Registry – where a dose-dependent relationship between hydrochlorothiazide and NMSC, both BSC and SCC, was identified. Increasing cumulative doses of hydrochlorothiazide are associated with an increased risk of NMSC (BSC and SCC). 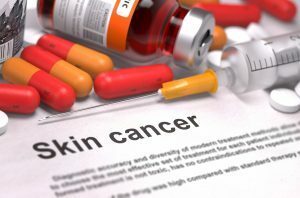 Patients with previous skin cancer who are receiving hydrochlorothiazide should have their medication regime reconsidered. Patients must be made aware of these risks, and as such any chances in skin lesions or moles, or any new skin lesions must be checked and reported. Suspicious skin lesions must be examined, potentially using histological examination of biopsies. Patients should limit exposure to sunlight and UV rays. Although the exact cause behind this increased risk is unknown, researchers hypothesise that the photosensitising actions of hydrochlorothiazide may be the culprit. Further research is needed to identify the exact mechanisms, in the meanwhile clinicians are asked to be aware of the risk and patients to be vigilant and check their skin regularly. The findings of these two pharmacovigilance studies, regarding the undesirable side effects of a drug that has been on the market worldwide for decades, highlight the importance of this kind of pharmacovigilance registries to ensure the safe use of therapeutic agents in clinical practice. These important studies also show the relevance of large national and international registries that provide vital information regarding use of therapeutic agents in real life patients over long term follow up. Pedersen SA, et al., Hydrocholrothiazide use and the risk of non-melanoma skin cancer: A nationwide case-controlled study from Denmark. J Am Acad Dermatol 2018; 78: 673-681. Pottergard A, et al., Hydrochlorothiazide use is strongly associated with risk of lip cancer. J Intern Med 2017; 282: 322-331. Direct correspondence from the British Generic Manufacturers Association, dated October 2018. Hydrochlorothiazide (HCTZ) is a thiazide diuretic, and is one of the most widely used drug for the treatment all grades of essential hypertension and for the treatment of oedema associated with heart, kidney or hepatic failure, diabetes insipidus and idiopathic hypercalciuria. In recent years researchers have identified a positive association between treated hypertension, diuretic use and breast cancer,  and renal cell carcinoma risk in women. Most recently two Danish pharmacoepidemiological studies analysed data from several nationwide data sources (including the Danish National Registry, the National Prescription Registry, the National Patient Registry and the Danish Education Registers). One of these studies reported a strong dose-dependent association between use of HCTZ and squamous cell carcinoma (SCC) of the lip, while the other study found that HCTZ use was associated with a substantially increased risk of nonmelanoma skin cancer, including SCC and basal cell carcinoma (BCC). Here, the researchers wrote that that assuming causality, the results suggest that one of 11 SCC cases diagnosed during the study period can be attributed to HCTZ use. Both studies indicate a possible increase in the risk of developing BSC and SCC in patients undergoing continuous and prolonged treatments with HCTZ, which could be explained by the photosensitising actions of hydrochlorothiazide. The subsequent safety review by the European Medicines Agency (EMA) and Pharmacovigilance Risk Assessment Committee (PRAC) recommend to the Marketing Authorisation Holders of medicines containing HCTZ to update the safety information. The new information is as follows: Increasing cumulative doses of hydrochlorothiazide are associated with an increased risk of NMSC (BSC and SCC). Reconsider the use of HCTZ in patients with history of non-melanocytic skin cancer. Clinicians are asked to be aware of the risk and patients to be vigilant and check their skin regularly. Request specialized evaluation (potentially using histological examination of biopsies) in case of skin lesions with suspicion of malignancy. Monitor the presence of skin changes in patients who receive prolonged treatment with HCTZ and inform them of the precautions to be taken in relation to the solar exposition. Inform patients on HCTZ about this possible increase in risk after treatments prolonged and warn them about: a) the need to limit exposure to sunlight and UV rays and to use adequate solar photo protection; b) The convenience of periodically checking the skin and consult a doctor in case of injuries suspicious skin or changes in appearance of existing skin lesions. Therefore, further research is needed to identify the exact mechanisms, and whether this is a class effect that extends to all thiazide diuretics. Given the wide use of HCTZ globally and the morbidity associated with NMSC, a causal association between HCTZ use and NMSC risk would have significant public health implications. Largent JA, McEligot AJ, Ziogas A, et al. Hypertension, diuretics and breast cancer risk. J Hum Hypertens.2006;20:727-32. Grossman E, Messerli FH, Goldbourt U. Does diuretic therapy increase the risk of renal cell carcinoma in women? Am J Cardiol 1999; 83: 1090–1093.